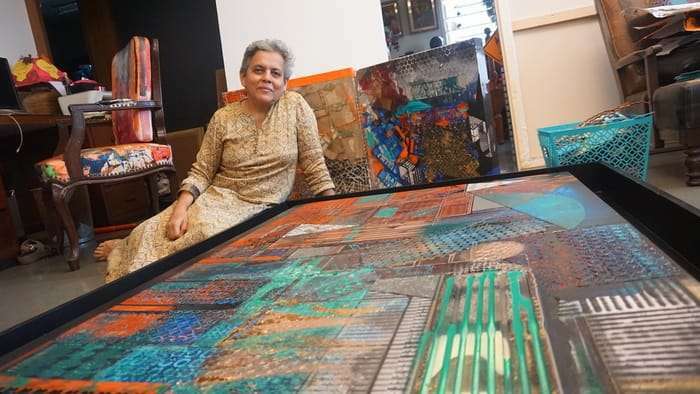 Brinda Miller was born and brought up in Mumbai, and it is from this city and its many versatile structures that she draws the most inspiration as she creates art. Brinda wears many hats- she is an Honorary Executive Committee Member at the Kala Ghoda Association, recently completed a term on the Advisory Committee of NGMA and is also an education and culture consultant at Chhatrapati Shivaji Maharaj Vastu Sangrahalaya (CSMVS). 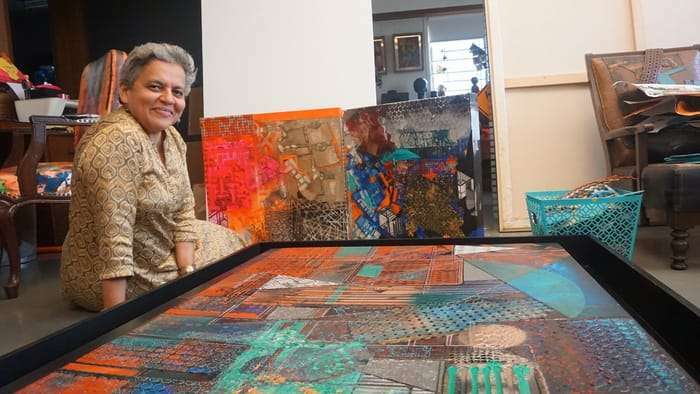 She is responsible for bringing Public Art to Mumbai and has been involved with creating murals around the city. ACF: When did you discover your love for art and when did you translate it into artwork? BM: I was good in art in school and my teachers encouraged me to pursue art. My parents were very supportive and I graduated with first rank in Textile Design from Sir J.J. School of Art. After working in the textile industry for a little, I held my first painting exhibition at the age of 23. My first show was a huge success. I went for my higher education to Parsons Institute of Design in US. This exposure completely changed my perspective towards life. ACF: What has been your inspiration for your paintings? BM: I find inspiration in my own city, Mumbai, which I love by observing people and the vertical structures and their architecture. Sometimes I get ideas by noticing shapes or colors around me. My favourite colours are rich Indian colours. Travel is also a source of inspiration for me. ACF: Do you have any idea or a mind map when you start painting, or are they a product of the moment? BM: I don’t plan anything when I start working on canvas and go entirely with the flow. The painting slowly keeps building up with textures and each layer. Even I want my paintings to surprise me at the end. ACF: We have observed sensibility even in the abstract artwork created by you and it tends to be very tactile. Do you think you still have an influence of your background in textile design? BM: I use a lot of textures, fabrics, wood, gold and silver leaf, paper and cloth in my artworks. I want viewers to be curious about my work and interpret it in their language. I am always happy to talk about my work. ACF: Who are your best critics? BM: My husband and my daughters. My husband is my best critic. I thank him for what I am and of course my parents have been a part of my journey too. ACF: Tell us about your involvement with Mumbai art scene and public spaces. BM: I have a fondness for Public Art. Left to me, I would encourage more public art in my own city. For me, aesthetically different coloured buildings and maintaining greenery and beautiful public spaces in the city is also a form of art. ACF: What is the process of selection of artworks and installations for the annual Kala Ghoda festival? BM: We start inviting applications from August onwards once the theme is decided. This time we are going to have around 40 art installations. I am involved with the visual art selection. Mainly emerging artists like to participate in this festival and they submit their plans for the sculptures and installations. We help the selected artists to develop these ideas further. Some senior artists also exhibit their work during the festival. 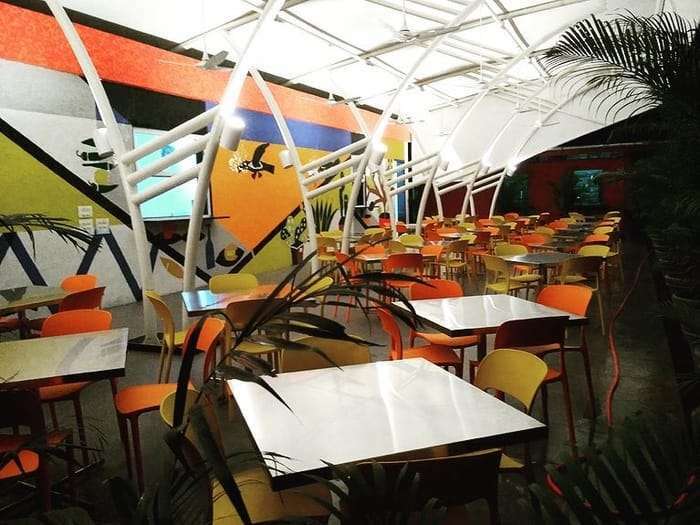 ACF: Which have been some of your favourite Mumbai projects other than paintings? BM: Amongst my favourite projects was redesigning Police Chowkys, I did the one outside Gymkhana with China mosaics a few years back. I also enjoyed making murals for the Canteen at the Police Headquarters. Three murals designed by me are displayed in the domestic and international lounges at the Mumbai Airport. ACF: How can artists contribute to a beautiful Mumbai? BM: The artist community can together work on murals in the city and make it more attractive like some other cities in the world. Recently an Art group started a project to paint the railway stations and contacted us at Kala Ghoda for ideas. I am very appreciative of such initiatives. We need to have more Public Art in our city. ACF: Which has been one of your favourite projects? BM: The cARTpet Project: The tufted carpets in this show are reproduced works of twenty -two of India’s leading artists. This project was in collaboration with Tarana Khubchandani of Gallery Art & Soul in order to raise funds for NGO Passages which supports breast cancer patients and their families. It has been a very successful project creatively and commercially. BM: My initial years as an artist were very exciting when all my work used to get sold on first day of the exhibition. ACF: What lies next for Brinda Miller as an artist and a person? BM: I want to continue my present journey happily in good health.